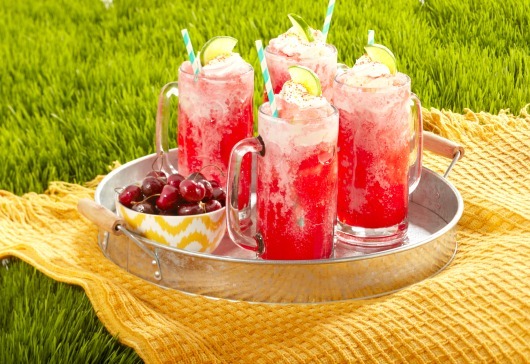 Looking for an icy-cold treat to serve at your next summertime party? Want one that will please the adults and the kids? If so, we've got a great recipe to share with you today from the great folks over at Sparkling ICE. Heck, I think this Fro-Yo Float would be great any time of the year and it looks absolutely delicious and it's super easy to make! A win-win for sure! Instructions: In blender, combine Sparkling Ice Cherry Limeade, sugar, powdered drink mix and ice; Blend thoroughly until slushy. Divide slushy mixture between 4 glasses, about 3/4 cup each, and add 1/2 cup frozen yogurt to each glass. Top with whipped topping and fresh cherry or lime slice. Serve immediately with a straw. This is a much healthier version of a milkshake and I would love to try it. I Have not yet tried the Sparkling Ice cherry limeade, but I like that idea of the tart lime and sweet cherry tastes intermingled.